Beginning in July 1937, only men were imprisoned at the Buchenwald concentration camp. Women were only sent there from 1944 onwards. Most of the women prisoners arrived in 1944-45 from other concentration camps, especially Auschwitz, Ravensbruck and Bergen-Belsen. Buchenwald was eventually liberated on 11 Apr 1945. The forms varied in what information was asked for and recorded. Usually on the prisoner records you will find their name, date of birth, category of prisoner, their nationality, what previous camps they had been interned in, whether they had died in the camps or whether they were transferred to or from another camp (this was done fairly often.) Often one can find their town of their birth and even their home address or perhaps their address in the ghetto. Were they single or married? What were the names of their parents? You can read about Vaclav Pisinger, who seemingly was part of the Resistance during the war. For those who curious as to what was asked of him during these inquiries, click here. These microfilmed records of Buchenwald prisoners are no doubt incomplete, i.e. there were probably more prisoners interned in Buchenwald than those whose information is recorded on these films--both those who died in the camps and those who survived. What information was gathered from the prisoner? Izrael Buskowoda was a Polish Jew, born on 7 Oct 1905 in Warschau (Warsaw). He lived in Littmanstadt (Lodz Ghetto, probably)) at Ul. Poludniowa 58, corner of Warthegan (?). He worked as a "turner." His wife's name was Ruchla nee Pranie (?). His father's name was Kaufmann Chaim (from Warschau), his mother Chaja nee Gliksman. He had a slim build and an oval-shaped face, brown hair and brown eyes. His ears were "labst"? He spoke both Polish and German. He was arrested 10 Feb 1942 in Petrikau (Piotrków Trybunalski, Poland). Izrael Buskowoda died 12 Dec 1944 at the age of thirty-nine, "set off/Abgesetzt" on 15 Dec 1944. What information was entered onto these cards? Above the word "Konzentrationslager" is an indication that Izrael Buskowoda is a "Pol. Jude." I can't say whether this was written here because he was Jewish or not. There is a line reserved for Religion, but here at least, it is not filled out. Numerical registers exist for tens of thousands of Buchenwald inmates. This is in addition to the actual registration cards and transport lists that are available on microfilm. The registry entries contain the prisoner number, religion, date of arrival at Buchenwald, date of birth, surname, given name, and importantly, if the inmate died, where and on what date. You can see above on the first entry that prisoner number 56463 was Nander Berlovits, arrived at Buchenwald on 6 Mar 1944, birth date 10 Jan 1896. He perished at Auschwitz on 10 Jun 1944. 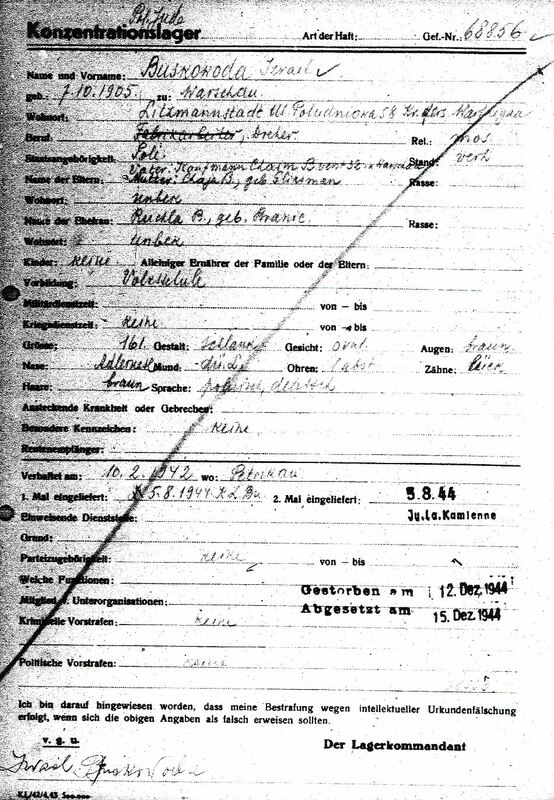 Seemingly, the last entry for a Ludwig Weiss, indicates that this inmate presumably survived the camps since there is no indication of a date and place of death.